Keep track of your important dates with A Better Calendar, easy to use calendar software which looks like a paper desktop monthly calendar but does much more. Attach notes, schedules and audio to any day, set alarms to remind you of important tasks, find notes and dates fast with date and text search options, print blank calendars, schedules and notes, and even upload a web calendar to share online with friends or associates. 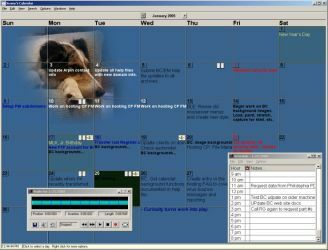 A Better Calendar is specifically designed to be simple to use, yet highly customizable, and provides you with visually identical desktop calendar, printable calendar, calendar wallpaper, web calendars and more! If you want to keep track of your time better, but have been put off by the complexity of PIMs, A Better Calendar is for you! Designed to keep track of important dates without much effort, most features are a click away and context sensitive help is always available. Download and try it out now.